Home / Home Brewing / Best Kind Of Brew Pot For Homebrewing? Best Kind Of Brew Pot For Homebrewing? There’s a few things that you definitely need to brew beer at home. One of them is a brew pot and unfortunately most beginner brewing kits don’t include them, so we’re left on our own to pick out the best one for our needs. When you’re starting brewing, you can get away with a 16 quart (or if you like to live dangerously, a 12 quart) pot. Sixteen quarts is four gallons and that will be big enough for most partial wort/extract based kits. In other words, the pot only has to be large enough to fit three or so gallons, then you add more water to bring it to five gallons later on in the process. If you want to plan ahead, look for a six gallon or larger one. That will hold enough for most full wort recipes. Aluminum Or Stainless Steel Brew Pot? The big question when it comes to brew pots, isn’t size, it’s what material is it made of? 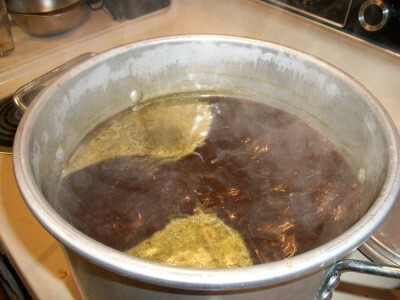 The short answer is that stainless steel is the gold standard, but beginning out you can use an aluminum brew pot. I have an aluminum brew pot and gets the job done quite well. Aluminum is cheaper and conducts heat better. That means your water will heat up faster, cool down quicker and you’ll have less risk of scorching. The bad news is that aluminum oxidizes easily, which means that you can’t use Oxyclean or One-Steap to clean them without damaging the pot. When you’re looking for a brew pot, the larger the better and you should look for one that fits your budget.